Christmas is supposed to be a holiday to bring families together, but really I don't want to be with my family. Not like I have much of a choice, supposedly I live with them after all, but actually most of the year I just hole up at training school. Though at Christmas every year my owner insists that I come home, and of course good ole Christmas time rolled around again, leaving me with a sick feeling in my stomach. I was down by the beach, writing haikus. The waves lapped up gently against the shore. I was completely at peace with myself and nature. It was always at times like these that I was disturbed. It was not The Techo Master that disturbed me from my as he seemed prone to do with his lesser students this time however, it was a Pteri messenger. "Not now," I whispered to myself, setting down my pencil. He stepped out from behind a palm tree shyly. "I have one letter for Amorada, is this her?" the Pteri squeaked. He trembled as I stood up from my meditative position. Did I really look that monstrous? I didn't think I was that dirty, or maybe it was the smell, I hadn't taken a bath in quite a while. That always did a good job of scaring the novices away. I irritably snatched the small letter out of his claws. "Yes, this is her." The Pteri thought about leaving without saying his rehearsed lecture on foolish protocol, but decided to torment me instead. "As The International Neopian Public Postal Service's faithful employee, I must unfortunately ask for some ID before you read that letter." He shot the words out swiftly, shifting from talon to talon. "What, is it going to contain a top secret code or something?" I looked at the letter with disdain taking one claw and opening it. Sending a scorn filled glance to the Pteri, I began to read it aloud. How are you doing? We are all doing fine back here at Neopia Central. It has yet to snow, and we all hope it will be a white Christmas this year. Rasor has taken up flying for the postal service; maybe he will deliver you a letter next year." I stopped reading aloud, imagining Rasor delivering a letter to me. He would arrive with loud squawks, sounding his coming on his trumpet of blasting. Then he would proceed to spiral downwards in great flamboyant flaps, winking at the occasional female Eyrie that should pass by. I hoped he failed the postal exam, I truly did. After that brief premonition, my eyes quickly returned to the paper. "Galwvin is heading off to Roo Island to serve as a maid for Lady Roo; we all anxiously await the results of her etiquette exam. Kate. Well, she has done a lot of reading." I let out a small chuckle at the mention of Kate, she was even odder than me, and the really the only member of our little family I found even slightly sane. "Christmas is never the same without you…" There wasn't much written for a couple lines, as if Cliché had trouble deciding what to write. I always caused trouble when I came home for Christmas, so there was actually very little reason for me to come home, other than tradition and Cliché's own little problems. I knew a great Scorchio psychiatrist she could see, she could solve her little problems and I would get off for Christmas, but I had tried that before, and it didn't work. I had to pay the bill too. After a field of blank space, Cliché had laboriously taken up the pen again. "We are making the turkey, and we look forward to seeing your beautiful red Kougra face at home. Please come immediately or I will send Rasor to collect you. I finished with reading with a flourish, tossing the paper to the ground. If I didn't want my nightmares to become a reality I would have to go home for Christmas. In my anger I was not expecting the green Pteri to still be there. He looked at me with furious gleaming eyes; I actually backed up a step. "Listen Lady, I have had enough of snobbish customers like you, your all rubbish. Don't know about proper work is what I say. Oh I try to be polite but you just insist on opening the letter. It's the month of celabratin' lady, give us a break. Yer customers are just like me bosses. All you care about is money and money and money." The small Pteri was now steadily moving towards me, one wing outstretched, pushing me back into the surf. His eyes shimmered of the repressed fury only experienced by underpaid employees, and let me assure you that anger in particular is a very powerful thing. A couple of minutes later I found myself face down in the sand, my fur wet, with only an hour to pack and a complain report to the postal service to file. It took a while for me to navigate through all of the crowds of pets; it was the weekend after all, and Wocky Day to boot. A lot of screaming pets were being dragged to our once peaceful training center. The Techo Master was looking quite flustered with the masses of pets being dropped on his doorstep. I would have helped out, but after the "You shall never learn the ways of the warriors if you continue to eat cheese" remark I wasn't feeling exactly amiable towards the fellow. Cheese is my passion, I actually even won an award for it once, a sincere interest it cheese, and it's in my old room. I passed him by, navigating my way to my current room. My room was bamboo filled. The floor was covered by a bamboo rug, the bed was dried bamboo, the bed side table was bamboo and even the ceiling was, you guessed it, bamboo. It all got kind of hard on one's eyes after a while, but I got to be away from my insane family, so it was worth it. After surveying the muffled silence (you could still hear the whining of a couple other pets a bit far off) I set to straightening out my room before I left. I made my bed, swept the floor a bit. Then hastily I prepared to pack. In my bamboo drawers were sets of clothes, and hats. There were so much to pack, and so little time. I hated the Christmas rush, it never seemed to end. I could probably get by without getting my 'family' anything, that plushie they got me last year wasn't that great and the Shop Wizard price was only about a hundred NP. With very little thought I tossed some clothing, a tooth brush, a short hair brush, and book together in a ratty bag. I felt around in my purse for a couple of NPs for the Eyrie flight there. I always settled for nothing less than premium. I would probably have enough stress in the days to come, and a bumpy ride would do me little good. Tugging along my bag haphazardly through sand, mud and a variety of other elements, I headed to the flight port. I seemed not that terribly out of place with the rest of the natives of Mystery Island, who were caught in between the holiday rush and the struggle of writing Christmas oriented haiku's. At the moment one was being read from atop of an empty tigersqaush box. I always found these poems more than slightly odd, as one, it never snowed on Mystery Island, there was only wet season, and wetter season, and two the lights were a pale attempt at cheer loosing almost all of their Christmas flavor when winking along in three four time to catchy congo line tunes. I quickly browsed through the crowds of Eyries advertising their flights, finding my old favorite, Bernie. I offered a slight wave, but my unpretentious motion quickly got lost in the mob of tourists. "Oy Bernie!" I yelled above the din, trying to catch the weathered purple Eyrie's eye. It took him a while to spot me, but finally he caught my eye. He mouthed something I couldn't understand, so I decided to head over. I pushed aside a group of old Elephante's with shirts reading: "We want peanuts and we them it now! The rights of Elephante's have been denied for too long, peanuts need to be an official gourmet food!" to reach Bernie. He was standing next an old weathered sign, reading in faded purple print. "High Flyers: Live the Adventure." "How are you doing?" he questioned in his usual serrated tone. "Fine, usual demands from the family." I smiled at him, but he offered only a worried frown. "Family is family, and you don't know what I would give to have a family like yours Andamora." He offered his wizened words like the Kyrii Mystic offered prophecies, constantly, so I didn't derive much meaning from them. I quickly changed the topic. "So, I need a flight. How much?" I began to dig around in my purse looking for some spare NP. Bernie winked at me. "For a pretty Kougra like you, it's free." I rolled my eyes. I watched him as he set up the carriage that he carried, meticulously tying it to his underbelly. "Thanks so much Bernie, I don't know what I'd do without you," I graciously thanked him. Bernie blushed, and continued the inspection of his equipment. "Let's go. According to what you said we haven't got any time to waste," Bernie commented roughly motioning to the carriage. I offered one raised eyebrow. Bernie was a kind old Eyrie, and something must have been bothering him, probably the tourists. The ride passed mostly in silence, me observing the spectacular view, Bernie stewing over what was bothering him. The landing was rough; Bernie was getting a bit bumpy in his old age. I was probably going to need a new driver soon, even though the ride was free. 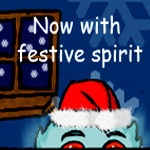 No matter how much I hate Christmas, there always is some magic in the air in Neopia Central. Snow blanketed the sidewalks and streets. The stores all had some kind of seasonal flavor; the music shop's tuba even had a mitten. The sweet sound of out of tune caroling graced even the dingiest alleyways. However Christmas is Christmas, and it still left that same materialistic taste in my mouth, but still it was much more muted then the feeling I got when I looked at Mystery Island come Month of Celebrating. My Neohome was bit further than where I had been dropped off. It was cold, so cold that if I spat in disdain at anything, my spit would freeze mid-air creating a beautiful sculpture. I kept up a brisk jog, dodging through alleyways and side streets, I didn't feel like being part of a crowd, at least not a Christmas one. I didn't feel like getting pushed around. It took a while but finally, I was in Suburbia Ala Neopia. Our Neohome was a two story building made out of a variety of materials, ranging from cardboard to chocolate. It was more than a little tilted to the right and emitted the smell of burning turkey. Why wasn't I surprised? I strode wearily up to the bamboo door, knocking quietly, silently wishing they wouldn't hear. Then I could walk away saying I tried, not to be pestered until next Christmas. Of course however, Galwvin had remarkable hearing, and so she was the one to answer the door. Her eyes widened to the size of a Small Elppa Pie. "OMGOSH. It's you!" "Very perceptive, aren't we," I commented dryly, beginning to inspect my claws. Kate peered around the entry way, fumbling nervously from foot to foot. I looked around Galwvin and smiled at her, glancing at the title she held in one hand. "Cybunny Down, that's a very hard book Kate. I didn't read that until I was twice your age," I commented kindly, moving into the entry hall, pushing aside Galwvin, who stumbled into the coat rack. "You're home!" Cliché cried. She was in the doorway to the kitchen, a bowl filled with batter in her hand. I frowned, observing the insanity that seemed to have racked my house since I had left. Toys and papers were strewn across the floor; the furniture seemed to have been bought by a compromise between tastes. There was a Kauvara Coffee Table on one end of the hall, and a set of zen drawers by the coat rack. Rasor shortly followed Cliché, though instead of patiently waiting in the kitchen, he half flew half bounced into the hallway, knocking over poor Kate. "Oh hello!" he screamed into my ear, getting into my face. "Helloooo!" he sang in an off-key warble. "Back off," I stated in a monotone, pushing the green feathered beast away from me. Rasor looked sheepish, but only for a moment. I then turned to Cliché. "When's Christmas again?" Instead of a polite answer and a cookie, I was rewarded with a glare. "That's not funny Andamora," Cliché scolded me. Just as she was about continue scolding me a large crash was heard. Galwvin and Rasor were dueling using their poor petpets as swords, Shelby the Feepit and Artania the Snow Kookith, who was beginning to melt. "For the love of Fyora, I'm going up to my room," I howled exasperatedly, but my voice wasn't even heard in the hubbub of Rasor breaking a cookie jar. I stomped upstairs, pried open my door, and then slammed it shut. Shortly after making sure I wasn't followed I ran right to my Zen bed. If I could sell dust I would make a million Neopoints. Everything in my old room seemed to be covered by it, sending all of my items into odd shades of gray. My old plushie collection had the touch of antiquity in their rough out of style shapes. A slight twinge of nostalgia hit me. I had run away from home, as fast as I could. I still didn't like it, but what I had done was, wrong. What could I have done though? I was crippling myself on the inside by staying with all of these imbeciles. A voice interrupted my reverie, a quite, shy interruption, but an interruption all the same. "Cliché says that were going caroling tonight." The unspoken demand "You're coming" hung in the air like water vapor. "Tell her I'm not coming," I half-shouted, the giver of the voice (Kate), probably shook at my demand. She was just adopted when I left so she never really got a good sense of me; maybe that's why we got along so well. A stretched silence hovered, waiting to be broken. "But I want you to come," Kate mustered the words together bravely, stuttering and stammering as she went. Was I really that imposing? I sat up in my bed, waiting for her to continue. "I like caroling, and I don't get to see you that much." Her voice gained certainty, like a mallard takes to water. Then with a huge step of audacity she amended her previous statement. "At all." I didn't really know how to respond, it wasn't my fault that I wasn't here to look after her. Not that that was my job anyways. I decided though that if I was going to be here I might as well make a little bit of an effort to be friendly. "I'll come." I responded in that same monotone, trying to let on that nothing had changed. After Kate left, I began to explore my old room, stirring up gargantuan dust clouds as I went. Happy with the various scarves, boots and other apparels I had dug up, I began to prepare for Mission: Christmas caroling without going insane, it would certainly be an adventure. A few symphonies of grunts and the occasional squeak later I was fully clothed and ready to go outside and face whatever dangers awaited me. Just as I was putting on my last mitten a giggly voice belonging to Galvwin called me down. "Come onnnnn! We are going to be like, late." I didn't even bother commenting on how one could be late for caroling, but instead headed peacefully downstairs. Everyone else was bundled up except for Kate, who claimed she liked to freeze to death. Soon we were out the door, parading about like a bunch of lost petpet's in need of good, sane, owners. It was below zero and of course my family was the only one out. The first Neohome we arrived at was a small stately thing, with the classic white picket fence, and a snow covered lawn. Somehow they managed to perfectly manicure a snowy lawn, making it look like a play set. Rasor was the first one there, knocking loudly. When a small Wocky opened the door we quickly began our carol. And a happy-" We had barely finished the first couple of lines when the door slammed ceremoniously in our face. The next couple of houses weren't that much better and soon we were all becoming, tired, wet and irritable. It was on the fifteenth house, when Rasor again decided on knocking that my patience shattered. "RASOR! Stop it. Your just wasting your time. Your all idiots you know. Its way below zero and you force me to go Christmas caroling. You want to know why I left home Kate, you all are why I left!" I screamed at Rasor mostly, but my anger was also directed to the whole family. The rest of the trip home was a long awkward hush, at least we were heading home, and for that I was thankful. When we got home the silence still remained, like a clear cover on a new couch. I decided that I wouldn't cause any more unease in our family for just a bit, and headed upstairs, for a nap. When I woke up a bit later, the heat was on and I could smell turkey roasting. I stretched lazily, showing all of my canines. I then quietly padded downstairs, but when I was halfway down the stairs I heard something that stopped me in my tracks, it was Kate. "We should just send her home. "But omgosh I wanted to give her a makeover!" Glawvin cried loudly. "I don't think she will appreciate it," Rasor remarked dryly. Woah. Back up. Rasor was acting intelligent. Something was terribly, terribly wrong. "You know Andamora just wants to see me as an idiot, I just get hyper," Rasor continued. I felt my heart sink a couple of centimeters. "She really changed since she went away," Kate mumbled into her book. "Nope, she hasn't changed a bit," Cliché pensively remarked. "Well I'll go tell her that she can leave now," Kate remarked dully. "It's the only way to solve it I guess," Rasor added sadly. "I just wanted to have Christmas, she doesn't know it, but I was going to ask her to come home for the summers too, but now I don't know…" Although all of the remarks saddened me slightly, this one frightened me the most. I never knew Cliché to be a very emotional person. As an owner she was kind, but strict. She always had a bit of a barrier up, as if she had to be strong for us, but in those words I heard her barrier crack just enough for me to see what a truly fragile person she was. "Alright then." Kate settled the matter, and began to head upstairs, right towards me. I could hide and pretend like I hadn't heard any of it, but she was getting closer. Just one more footstep and she would see me. "Andamora!" Kate exclaimed, her determination turning into confusion. I held up one paw, stopping her spluttering. "I heard it all," Kate began to defend her previous words, but again I stopped her short, "and I'm sorry." Kate's confusion only deepened with my words. "But-but- you hate Christmas?" She stammered. I grinned. "I hate Christmas, but you know what?" I teased. "What?" Kate questioned seriously, taking a couple steps towards me. My grin only grew. "I love my family."